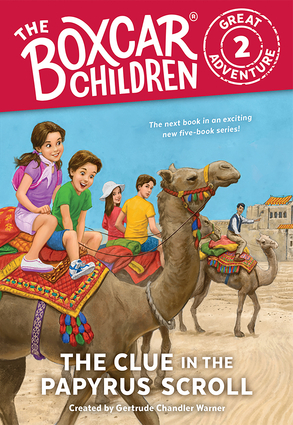 In this all-new very special mini-series, the Aldens have been recruited by a secret society to return lost artifacts and treasures to their rightful locations—all around the world! The Aldens arrive in Egypt but the agent they’re supposed to meet has gone missing! With the help of a puzzle in a papyrus scroll, they figure out their next mission—to deliver a tiny ancient pharaoh statue to an archaelogist at the Pyramids! Along the way they outwit a thief who tries to steal all the treasures. Their next mission is to England, to return one of the “crown jewels of Stonehenge.” But someone is following them! Could it be someone from the powerful Argent family, ruthless antique collectors and bitter rivals of the Silvertons?